Suitable for screen printing on substrate in sheet / film / board form such as IMD film, Smart Phone Cover Lens, Dash Instrument Panels, Membrane Switches and many other applications. Suitable for precision curve screen printing on molded substrate in cylindrical/conical oval shape. Example: Cosmetic Bottles, Cans, Appliance Casing, Oil Filters, Engine Pistons, Pens, Can Coolers, Growlers, Coffee Mugs, Water Bottles, Containers and many other applications. 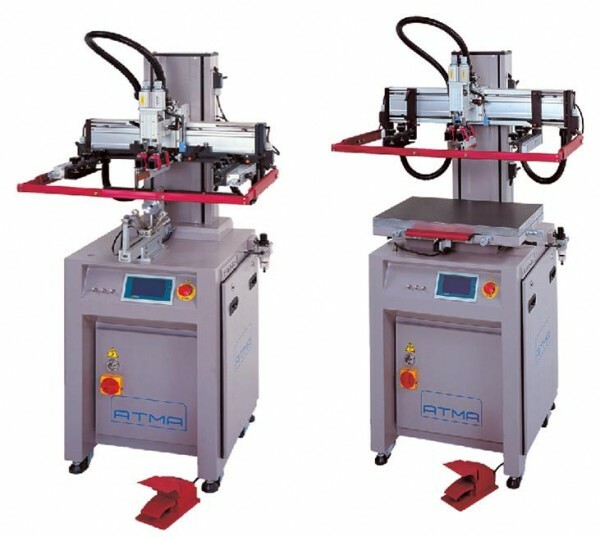 Semi-automatic: hand load / hand off-load with controlled automatic printing. 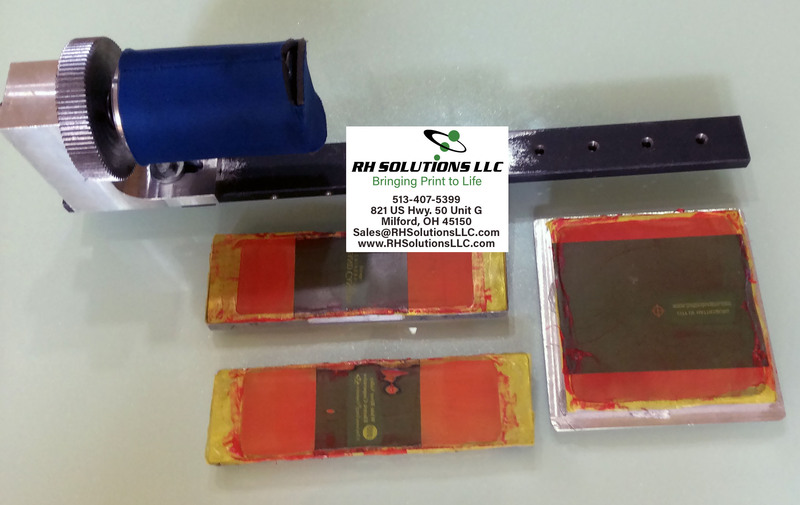 Includes substrate-holding device for curve screen printer. Easy changeover in minutes from curved fixture to vacuum print table and/or vice versa. HMI digital touch panel screen provides user-friendly control with multiple printing functions and operating parameters, includes presetting throughput of current yield along with built-in error diagnostics. 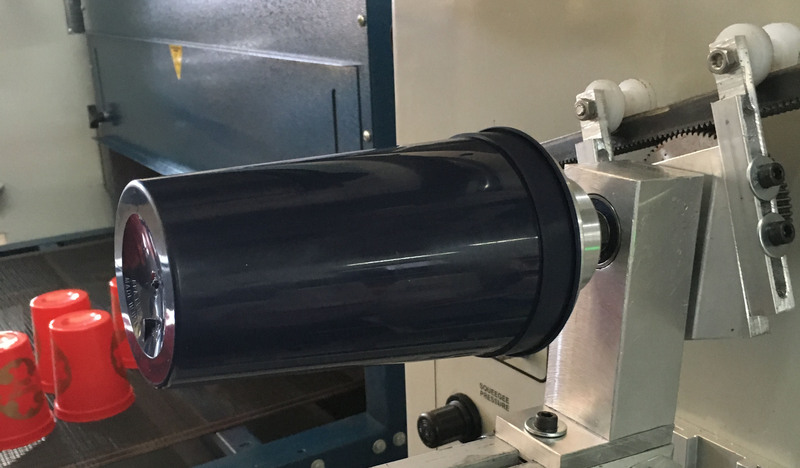 Horizontal head lift; screen is parallel with printing table/chassis base for even ink flow. Optimum ease of use with open access for accurate substrate registration, off-load, screen cleaning and all setup controls within close reach. Dimension(WxDxH) 92cm x 75cm x 171cm 36¼" x 29½" x 67⅜" 96cm x 78cm x 171cm 36¼" x 30¾" x 67⅜"
Maximum print diameter - - - - - - 144mm x 200mm Ø5⅝" x 7⅞"
Max O/D frame size (DxW) 500mm x 750mm 19¾" x 29½" 280mm x 720mm 11" x 28⅜"
B. Flat: Printing table surface is CNC precision milled and manufactured from high quality anodized aluminum to achieve close tolerance planarity. Honeycomb construction for rigidity, while offering powerful, heat-dissipating turbine vacuum to prevent movement of substrate. 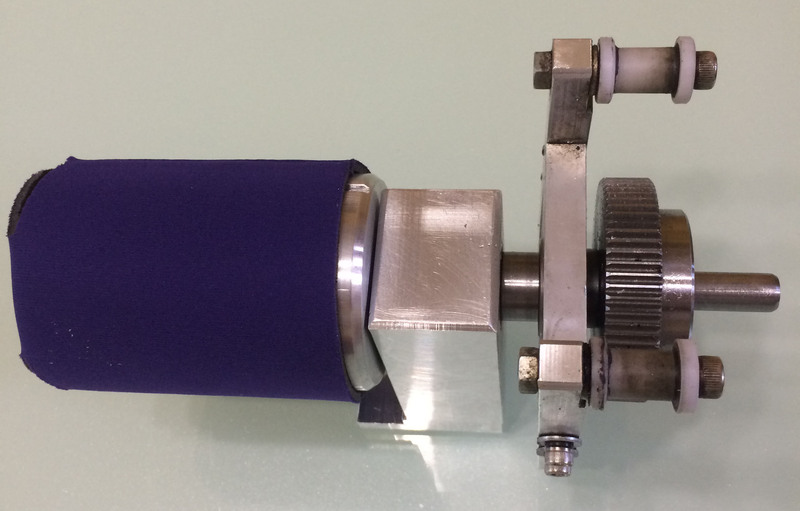 Suction force is adjustable for optimum substrate control and printing requirements. C.	Curve: Substrate holding device equipped with gear shaft bracket with gear drive linked to round substrate rotation allowing synchronized printing. 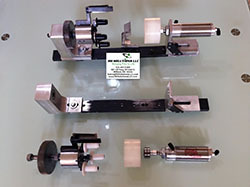 Gear rack press roller unit to guide and keep gear rack from moving during fast cycles and assures that the substrate is synchronized with the screen movement. 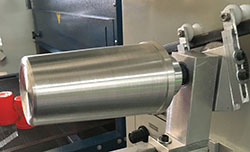 Base holding device can be adjusted for angle of substrate during printing sequence. T-trough track is base for attaching all holding accessories. Two sets of holding wheel brackets to support substrates in/out, 90-180° distance between plastics wheels which is adjustable to support round substrate. Adjustable center blowing bracket for different lengths of substrate. Transmission spur gear to synchronize substrate with gear rack press. Substrate holding wheel to hold substrate during print cycle while rotating. Shaft for driving substrate and mold for rotation. Air blowing vent into bottle for rigidity during printing or can be fitted with front mold for rigid round substrate. Includes cylinder for in/out ventilation allows automatic push into position for loading and unloading of substrate. 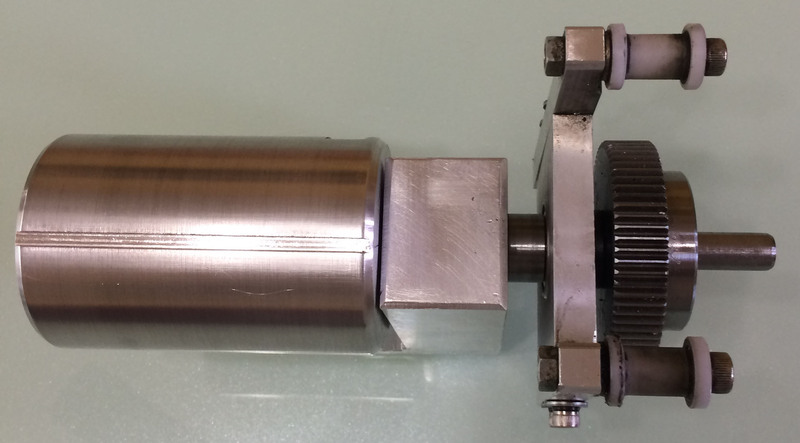 D.	Travel of squeegee / flood on guided precision sealed linear motion bearings, reinforced tooth belt, timing belt wheel for high rigidity and ultra-smooth high print speed transport cycles without backlash. This ultra-smooth gliding of the squeegee / flood assembly enables step-less speed change for higher production speed, smooth operation, consistent / uniform printing deposit control, less maintenance and fast operation. E.	Squeegee / flood high-park capability facilitates faster setup and changeover. H.	Squeegee and flood parameter settings for speed, pressure, and stroke travel distance is independently controlled by single action from the touch panel screen. I. Print table X / Y movements via precision scaled micrometer control(s) for fine registration. Play-free registration without backlash. J. Touch screen control of off-contact height between substrate and screen. Numerical value can be set up to accommodate substrate thickness 0 – 50 mm (0 – 2”). K.	Choice of six print functions from touch screen: flooding before the print stroke, flooding after the print stroke, higher cycle speed-flood while screen lifts to full up position (right original point) for both flat and curve printing. Flat printing includes double squeegee printing mode with use of two squeegees mounted allowing printing in both directions and screen lift up to print position, twice printing mode (flood while screen lowers and the last flood when screen is in up position) and double squeegee mode with use of two squeegees to perform left print direction while right squeegee is idle and right print direction while left squeegee is idle. Curve printing has 3 auto print modes: flood coating after print stroke, flooding before print stroke, and higher cycle speed-flood while screen lifts to full up position (left original point). Includes no flood setting and print head lift for ease of sq / fl load and unload without removing for fast setup. L.	Touch screen input of printing standby height 50-350mm. This is the distance that the screen lifts up after the squeegee and flood sequence. Numeric value can be preset to stop the screen in a lower position for increase cycle speed. 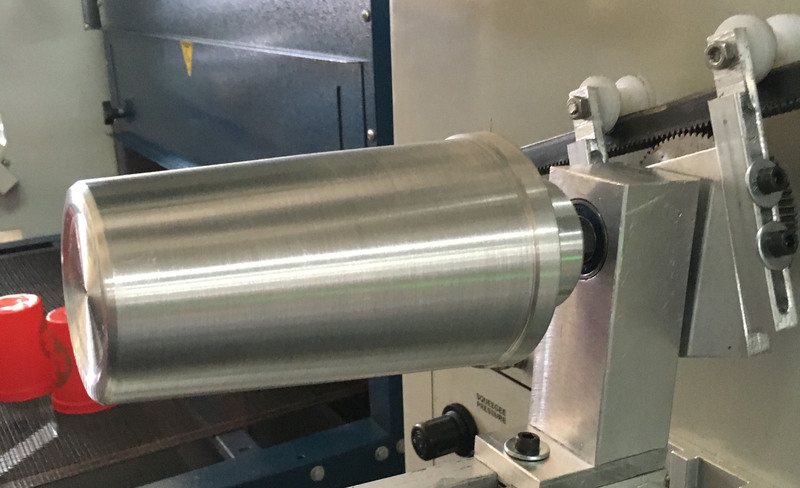 M.	Squeegee / flood assembly is synchronized and changeover is pneumatically operated for smoother transition. Adjustable height controls, angle settings 0-30°, leveling and skew feature. Provides uniform ink deposits across the entire print area. N.	Touch screen input variable and independent for print and flood stroke speed and length setting to image size. Flat numerical input of right print stroke start point 0-140mm and left stop point 180-330mm. Curve numerical input of right print stroke start point 0-240mm and left stop 280-530mm. Setting for letting upward first position before the end of print stroke 0-50mm. O. Print operating cycles: Manual setting for set up procedure, setting for foot pedal control in single cycle and automatic control with dwell timer range of time selectable for substrate loading, auto-print and off-loading. P.	Productivity preset in numerical values for throughput can be changed anytime. Enter production quantity according to run length and during the run screen will indicate current yield until preset number of prints are achieved. Q.	Frame loading and unloading from the front of the machine to facilitate fast setup and changeovers. R.	Control system for compressed air supply is an oil free FRL unit to prevent oil mist pollution, applicable in clean room environment. Less air consumption, ½ HP air compressor is enough. S.	Emergency press plate positioned in front of print table in case substrate alignment is not in the correct position. Operator can press the plate and printing head slowly lifts up to the full upright home position allowing operator the chance to register correctly final substrate alignment. (Flat mode only). Reduces spoilage and yields more printed product. T.	Front safety bar location on the print head, compliant with OSHA safety regulations. U. Includes 5 squeegee holders and 5 flood coaters, sq. / fl clamps, squeegee rubber for flat + curved, pedal switch control, toolbox, tools and door key.